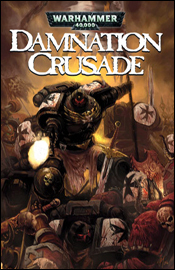 Warhammer 40,000: Damnation Crusade, on shelves this week from BOOM! Studios, provides an interesting look at the consistencies and differences between modern warfare, historical battles and a fictional, futuristic battlefield. It pits the forces of the Imperium of Man, clad in gigantic suits of robotic armor, against both an army of inhuman creatures and their own inherently human limitations. “Pain is an illusion of the senses – despair an illusion of the mind,” one superior barks at his subordinate, at once delivering something familiar and something foreign. It’s a great line, which wouldn’t be out of place at all in a war zone or a locker room today, but it takes a different meaning in the future, when physical pain receptors are intentionally burnt out of new warriors. Evidently, by the 41st century, the military has taken an age-old concept (pain is only temporary) and perverted it into something completely different (pain is irrelevant). As the story unfolds, this becomes something of a theme – the rules of combat are familiar, but skewed just enough to let you know that something’s strangely different. Writers Dan Abnett and Ian Edginton display a good feel for the scale of this story, ending the first chapter with the awe-inspiring visual of an airship hovering above an ancient, crumbling castle. It’s something they never lose sight of, whether they’re showing their readers a firefight between fleets of enormous, city-sized spacecraft or a pile of bodies twenty feet deep, with fresh blood doing battle directly above. This feels like a tale with a large impact, shaking planets with its importance and shaping the universe with its consequences, which is just as it should be. A lot of the interspersed dialog is tough to follow, especially when the generals get to flapping their gums. Their conversations are part medieval, part tactical and all bland. While they’re discussing events and strategies that are vital to the progression of the storyline, their speeches are so ridiculously lengthy, picked from such a strange vocabulary, that they largely go unrecognized. Ever tried reading the dialog in a Shakespearean play? It’s the same deal – the words are there and they’re technically correct, but they’re so far from the current dialect that it’s hard to find any purpose to them. When was the last time you and your buddies got together and somebody spit out something like “What passes for blood would run chill in their heretic veins! Such victory is a sweet benediction. To sip at the cup of glory is a moment to be cherished…”? If you were curious, that’s a line from Warhammer, not Titus Andronicus. As I touched on in the introduction, there’s one theme that’s constantly reinforced throughout this book, and that’s the importance of the unit over the individual. And, while that’s a motif that you’ve probably seen in countless war movies over the years, it’s handled a little differently here. Where heroism and praise seem to go hand in hand in our current culture, the war machine of the 41st century follows a much stricter code. If even the slightest hint of ego or self-adulation is detected in a warrior, he’s ostracized from the group and cast aside. Even in the heat of battle, the commanders are reinforcing the idea that the most glorious way to die is in the line of fire for the empire – something of a fanatical twist on an age-old concept. It seems like an opportunity is lost when every single face on the battlefield is in complete and utter agreement with this practice, to the point that one soldier even worries to his master that he may be taking too much pride in his accomplishments during war. On one hand, it establishes just how revered this theory is in the current situation, how strong a grip this mentality has on its followers. On the other, it paints both sides of the battle in a similar hue: righteous in their own minds, but not necessarily in the reader’s. I had a hard time choosing which army I wanted to see win this war – the “heretics” who fought tooth and nail against this kind of singular mentality, or the disciplined, armored masses who are the subject of the series itself. Tankred, an enormous monstrosity of steel body and human psyche, is a perfect example of the ideal imperial soldier. While the rest of the cast throws around bad dialog before, during and after their battles, the enormous Tankred sleeps, rising only long enough to fight another battle, decimate his opponents, and then return to slumber. Only awakened when the circumstances are dire enough to require his presence, he often dozes through entire centuries, waking shocked to find that an old friend has died, that entire planets have shifted. Disoriented, he sorts out the fragments of his existence for mere seconds, before dismissing the past and moving forward with his next violent objective. He’s easily the most tragic figure of the story, and probably the only individual with which I could sympathize as a reader. It’s a wonderful side story, not something I’d want to see featured in its own series, but it’s also perhaps the only universally successful plot thread of the paperback. On the artistic side, JM Ringuet’s colors really steal the show, enhancing the illustrations beyond their original strength and granting the book a solid, unified look and feel despite the presence of multiple artists. He frequently decorates the page with thick, painterly strokes but never seems to skip out on the fine details when they’re needed. While the majority of the book is cast in shadow, he manages to introduce a wide range of accents to the mix, whether he’s drawing your attention to the fresh blood on the edge of a soldier’s sword or driving forward the features of a warrior’s face. This book wouldn’t be halfway as visually intriguing without his efforts – he takes artwork that’s average at best and transforms it into a near-masterpiece. The colorist also does some great work on backgrounds, whether the illustrator chooses to detail them or not. If there’s a rigid backdrop to bring to life, such as the giant, billowing clouds that frequently rise from the field, Ringuet does so in style. If he’s granted nothing but blank space and dead air, he sees it as an open invitation to play with abstract textures and splashes of color. And, while he does occasionally take that creative liberty a bit too far, distracting the reader from what’s going on in the foreground, for the most part his contributions are breathtaking. His work is the first thing you’ll notice about this book, and he’s responsible for almost all of its spirit. Lui Antonio handles the illustration chores for the first, fourth and fifth chapters, and while he could use a little seasoning, he clearly has a thorough understanding of the subject matter. For a book that’s based off of a popular series of sculpted miniatures, (themselves a vehicle for a table-top fantasy game) the importance of that can’t be overstressed. He renders these enormous suits of mechanical warfare with care and respect, never missing an opportunity to reinforce just how imposing and gargantuan they really are. He’s fortunate to be working on a story so largely focused on robotics and giant suits made of reinforced sheet metal, too, because he really struggles when asked to illustrate a swordfight or dialog without the armor. His characters feel rigid and uncomfortable, with muscles just a bit too over-detailed and facial expressions a little too grotesque for their own good. He’d have been a great fit at Chaos! Comics in the mid ‘90s, and I don’t mean that in a good way. So long as he’s handling bizarre, hideous creatures or lumbering, smoke-blackened war machines, he’s in his element – and that’s the case more often than not. Chapters two, three and six feature the artistic talents of Greg Boychuk, who works a less excitable style than Antonio’s, but also doesn’t feel out of place when dealing with a simple conversation. While his work is a bit more fleshed out, quite a bit easier to follow than Antonio’s, he doesn’t bring the same impact or emotion to the page. His conversational scenes may flow across the page more effortlessly, but they aren’t nearly as interesting. Where Lui brought life to the cold, heartless machines that dominate Warhammer’s battles, Boychuk gives them a plain, everyday, overly technical look that pales in comparison. They feel like toys, not gargantuan bringers of death and destruction, and that works against the tone that the story is trying to set. When the metallic hordes are set loose upon an army of bloodthirsty Viridians (ogres) at the beginning of the third issue, (and again at the onset of the fourth) the quality of Boychuk’s artwork picks up noticeably. He tells a great story during the chaos of an all-out battle, which is reinforced by JM Ringuet’s decision to bathe the first fight’s opening moments exclusively in black, white and selective reds. It’s a sharp contrast to the deep, rich colors that had preceded it, and forces the reader to pay closer attention and a bit more respect to the illustrator’s original contribution before snapping them back to reality. But while Boychuk proves his worth throughout the story’s lengthy fight scenes, he then settles back down into complacency as soon as the battle is over. It’s frustrating to read, actually, because he’s very good while the action lasts, but equally lazy during the discourse away from the battlefield. This is particularly evident as the story wanes near the middle of the sixth and final chapter. Boychuk’s work here is sloppy and undisciplined, which stands at odds with the strength he exhibits in his earlier contributions. As far as translations of existing properties go, Warhammer is a fairly good one. Its roots are set firmly in territory that should be familiar to followers of the table-top game, but the events and surroundings are interesting and developed enough to catch the eye of certain readers unaware of the source material. Basically, if you’re a fan of gunfire, swords, blood, guts and action, this is right up your alley. It’s about three quarters action, one quarter elaboration – and you’re never more than five pages from the next bloody massacre. If you consider yourself more of an all-around reader, you’d better flip through this in the store before making up your mind. Phenomenal colors and a galactic scale in the storytelling make this book worthy of a second glance, but convoluted dialog, underdeveloped characters and a slow pace keep it from being a must-buy.